One of the most characterizing aspects of Homecoming and Family Weekend is the annual football game. 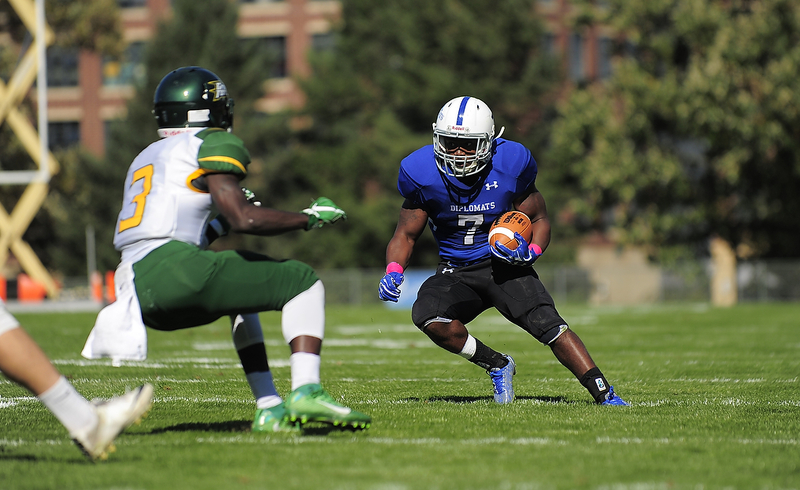 On Saturday, October 15, F&M Football faced McDaniel for one of the most attended games of the year, defeating the Green Terror with a score of 25-7. F&M dominated the entire game, capitalizing on an early opportunity to connect on a 32-yard field goal halfway through the first quarter by F&M’s own Billy Zwicharowski, giving F&M an early 3-0 lead to work off of. Nearly over a minute into the second quarter, F&M’s Vincent Moffett picked off a pass by the Green Terror and, three plays later, F&M’s Zachary Bradley found Taalib Gerald for a 10-yard touchdown. The 10-0 score quickly turned to 11-0 within a matter of seconds by F&M’s Fortunado Perri, who capitalized on the two-point conversion. Bobby Keys led the Diplomats to an 18-0 lead, with the help of Gerald who completed 44 yards on the ground before Bradley connected with Keys to score the second touchdown of the game. The third and final touchdown of the game was complete by Gerald who completed at 25-yard pass from Bradley, bringing the Dips to a score of 25-0. McDaniel scored 7 points in the fourth quarter, but their effort wasn’t enough to offset the Diplomats’ victory. Gerald was undoubtedly the MVP of the game, totaling 192 all-purpose yards with two scores, to bring home the Homecoming win. He rushed for 119 yards on 21 carries, added another 41 yards on three catches, and picked up 31 yards on a kickoff return. Gerald was assisted in the defeat by Dave Shellhamer and Bradley who, together, contributed a total of 245 yards and three touchdowns on a victorious afternoon for F&M. The team continued their recent momentum by capturing a 24-17 win over Moravian College and extending their winning streak to 5 games. They travel to Susquehanna next weekend in what will be a crucial game in the hunt for the Centennial Conference Championship. First-year Gabby Goodwin is a staff writer. Her email is ggoodwin@fandm.edu.